The Saturday Thing was initiated in 2006 by MIT's Ed Moriarty, an instructor at the Edgerton Center, and is characterized by unstructured play in a constructive environment. The day-long sessions engage and inspire children, teenagers, and adults in a variety of project-based engineering activities within a community-supported, student-led workshop setting. 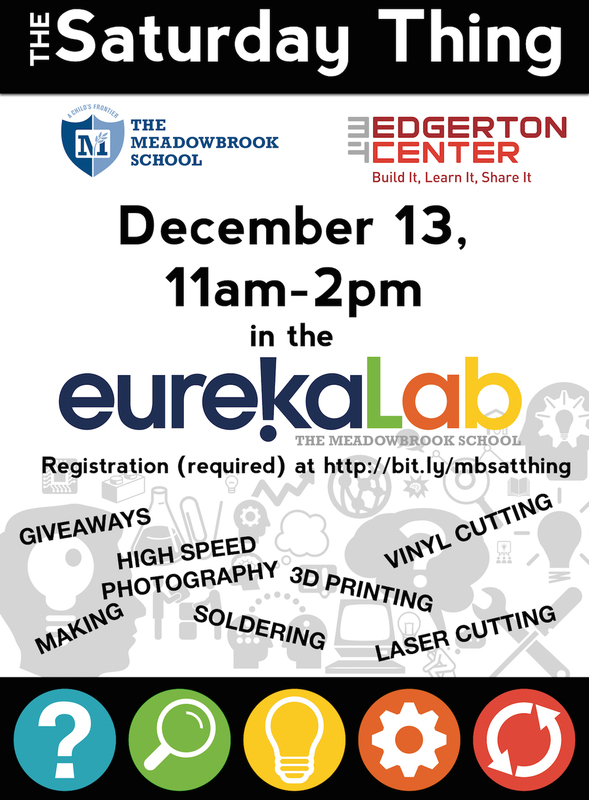 For Meadowbrook families and beyond, the Saturday Thing is a chance to get hands-on with our maker tools. Try 3D printing or soldering, use our vinyl cutter or laser cutter. Come with a project in mind, or choose from one of our recommended projects for all levels of experience. Meadowbrook and MIT staff will be on hand to help you build, make and discover. Please contact Meadowbrook's Director of Innovation and Technology with any questions, jschmid@meadowbrook-ma.org.